Randle, a senior sociology major and African-American and psychology minor from Kosiusko, MS, is the President of Millsaps’ Pride organization. “Coming from high school in a very small town where I wasn’t able to be myself in the space I was in (made me initially want to join Millsaps’ Pride),” Randle said. After making the decision to go to Millsaps, Randle says that they feared that, due to Millsaps’ Methodist affiliation, they still would not be able to comfortably exist as someone who does not subscribe to heteronormative boundaries. Randle found that, however, on arriving to Millsaps, they felt comfortable enough on campus to express themselves in whatever way felt right for them. In 1978, San Francisco artist Gilbert Baker designed the gay pride flag, also known as the LGBT pride flag or rainbow flag. Recognizable almost immediately, each color on the pride flag represents something. Violet represents spirit; indigo/blue represents serenity/harmony; turquoise represents magic/art; green represents nature; yellow represents sunlight; orange represents healing; and red represents life. The flag, a symbol of lesbian, gay, bisexual and transgender pride and activism, is now used globally. In the Millsaps Bowl, a version of the pride flag flies from the balcony of the Leggett Center. 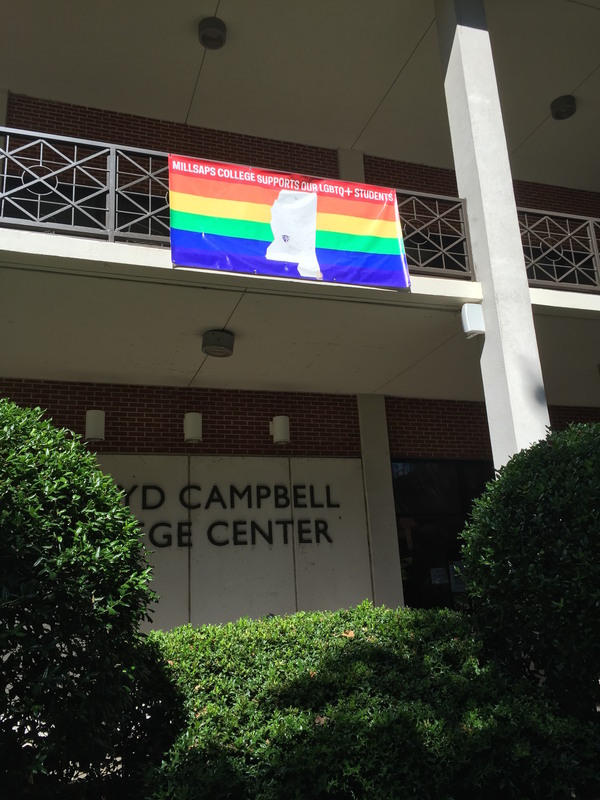 Millsaps’ flag utilizes the popular five-stripe flag (it is red, green, yellow, blue and violet), and says, “Millsaps College Supports Our LGBTQ+ Students” in large, white letters. Below the word support, is an outline of the state of Mississippi with Millsaps’ emblem over the heart over Jackson. Though LGBT groups have succeeded in achieving increased national visibility in recent years, they are still largely kept out of the mainstream narrative. BiWeek week, which was from September 19 until September 26, for instance, passed with little to no significance on Millsaps’ campus or on a national scale. Stickers that self-identify Millsaps as a safe space for LGBTQ students can be found around the campus, but what exactly constitutes a “safe-space” is largely up to interpretation. Dr. Tamar Shirinian, a professor in the sociology-anthropology department, is the advisor of the Millsaps’ Pride organization. Shirinian said that safe spaces are necessary for everyone. “But, there are some people for whom the world at large is not a safe space, so those spaces become meaningful… For a campus, it would be important to have that for people who feel somewhat marginalized in what would be the ‘norm’ space—the classroom, the common spaces on the campus,” Shirnian said. She continues by saying that “safe spaces” are not necessarily institutionally sanctioned places, and are often times hard with family or friends. Randle views a safe space as an area in which you can be who you are, but is also a place where you take criticism to help each other grow. “You can be free as hell,” Randle said.